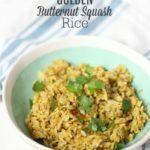 Creamy and buttery butternut squash rice is the perfect simple side dish to any meal and is only four ingredients! 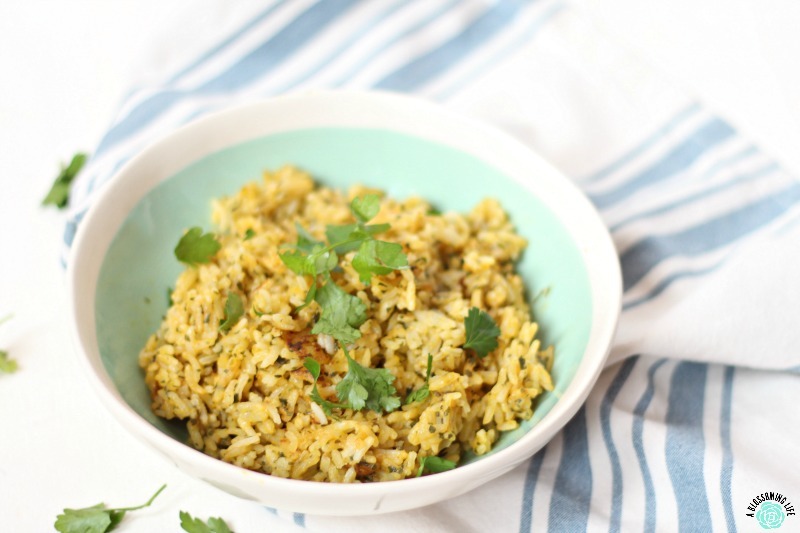 This recipe saved lunch one day when I had little time and pretty much no ingredients. 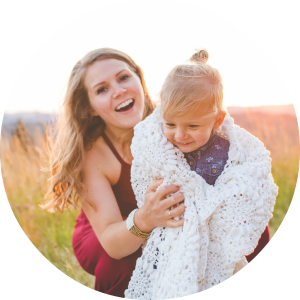 Now that I have a toddler and a newborn, simple, quick, and healthy meals are where it’s at. Sometimes, random ingredients thrown together oddly taste really good. Don’t you love when that happens? I’ve been on a desperate search lately for convienence foods that are not full of terrible ingredients. One thing I was really excited for when we moved to Oregon was that there was a Trader Joe’s in our town. Yes, dorky, I know, but this place is my favorite. Even August thoroughly enjoys it. Probably because the employees give her stickers and fruit, she gets to color, and she eats a snack with our friend that works there just about every time we go. Heck, my water broke with my son there (you can read his birth story here). So, my love for Trader Joe’s runs deep. My friend and I joke that we need to get August a t-shirt that says “future Trader Joe’s employee” and Ari a onesie that says “I was almost born at Trader Joes!” Since originally writing this post the other day, my friend did get her a Trader Joe’s shirt! Pure love. Anyway, besides being best friend material, TJ’s (we’re on a nickname basis now) offers amazing food. They have some awesome healthy and convienent convienence foods, like the spirilized carrots and zucchini, premade frozen rice and quinoa, organic soups and stocks, salad kits, many varieties of nuts, seeds and dried fruits, grass-fed yogurt… I could go on and on. When I made this, I used their premade frozen rice, but you can definitely make it with rice you already cooked at home. We recently moved into a 1970’s fixer upper (click here for a tour) and went through – are still going through – a kitchen renovation. We have been living on quick and healthy convenience foods. This rice was one of them. Simple, fast, and only four ingredients. Plus, if your kids are picky eaters, they may not even know that there are vegetables in this. Sweet. 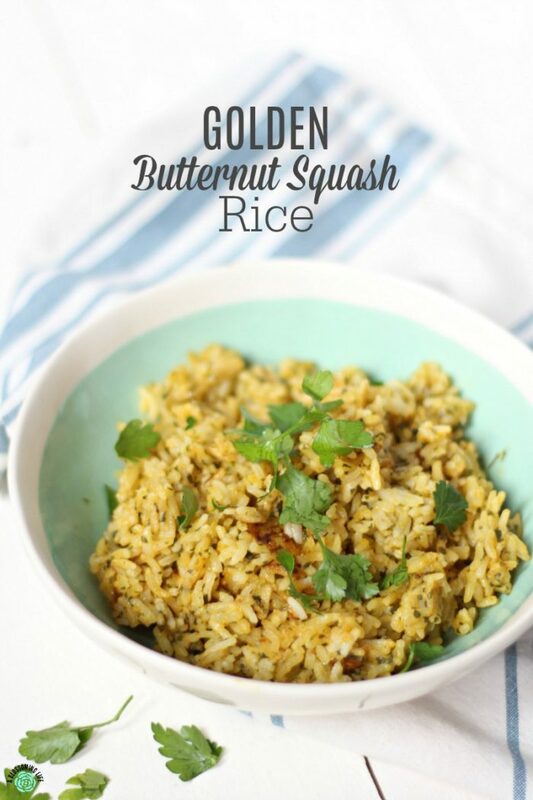 In a skillet over medium heat, add in butter and rice until the butter melts and rice begins to cook. Add butternut squash soup and cook until thickens and starts to brown. Toss in dried or fresh parsley and serve. This would probably be awesome topped with some parmesan cheese and bake in the oven for a few minutes until the cheese starts to golden (I wouldn't know since we don't do cheese or milk, I'm just assuming extra deliciousness). When reheating leftovers add in extra butter, as reheating tends to dry out the rice. What is your favorite convenience food to eat? Mine is frozen chocolate covered bananas – more of a snack than a meal, but in desperate times, the definition of meals becomes pretty flexible.